The Chocolate Review | It doesn’t take a genius to work out what goes on here. Just wanted to confirm that tonight The Chocolate Review moved off WordPress and onto its own website. I CAN NOW BE FOUND AT THE FOLLOWING WEBSITE!!! All my old posts are there as well as all the old comments, in fact the blog looks pretty much the same, but it’s better for me. So please update your bookmarks and tell everyone you know that I have moved! Thanks to everyone for their support, comments and everything basically over the past 4 months. Let’s move forward together and continue with the wonderful community and even better chocolate! I have decided to take The Chocolate Review off WordPress and move it onto a proper server. I’m currently in the process of just sorting everything out so it will be offline until I make another announcement. I will make another announcement when everything is done. Until then, sit back and relax, look through the old reviews and enjoy your chocolate. I would also like to thank each and every one of my readers for this, I started this blog 4 months ago after looking at a couple of the other ones on the internet, and had no idea that I too would one day be on their blogroll and visited by so many people, it means a lot to me and I hope that everything on the new website runs just as, if not even more smoothly than this one. I like the little bit of blurb on the front of the pack – “You obviously have a keen sense of taste. Because these Dark Choc logs are made to our unique recipe, with a delicious chocolatey centre carefully made from an old Belgian recipe”, so I have a keen sense of taste? Thank you RJ! What you have here is a long dark chocolate stem, covered by a thicker stem of orange flavoured licorice. The licorice today is unsurprisingly orange in colour, like the red raspberry licorice yesterday. But it’s the way it’s done that’s so good. The chocolate and orange go so well together, it’s a classic blend of flavours and RJ’s have got it right here. I don’t know how dark the chocolate is but it didn’t seem that dark to me, it was very good though. Just for a such an initially strange sounding combo, it all goes together so well. The bar has 162 calories, 1.16g of Protein, 30.1g of Carbohydrates (16.4g of which sugars) and 3.5g of Fat (3.1g of which saturates). I highly recommend this bar if you can find it, RJ have impressed me again, delicious stuff here. And now begins the mini series of RJ’s Soft Eating Licorice. The first is the Raspberry Licorice Log. This is basically a ~20cm (just guessing here) long pencil-like log of licorice, that’s raspberry flavoured. From what I understand, these are very popular in New Zealand, where the company originates from. My local shop got these from a supplier who imports them. It’ll be very hard to find these anywhere in the UK, so it’s best not to worry about finding these too much, unless you’re really desperate for them. This bar doesn’t actually look like regular licorice, instead of being black in colour, this is completely red, and can just about be seen through. I suppose this is a good idea, considering the flavour of it, and it’s not an off putting colour. I hear that red colours in food activate salival glands and such forth, making you hungry, due to it meaning that a food is ripe. I don’t think I felt that when I looked at this, but it did look and smell good. Not a strong smell, but a pleasant, mild raspberry waft. It tasted good as well. There’s no distinct licorice taste, it’s instead just a mild, pleasant raspberry taste. I don’t think it would have tasted nice if there was ordinary licorice flavour there as well, so I’m not sure how they’ve got rid of that flavour here, but they’ve done a good job. I’ve tasted the other flavours previously and they’re nearly all better than this, but that doesn’t take anything away from this bar. It really is quite nice. And the wonderful thing about this is that it only has 138 calories. Pretty awesome compared to most snack foods here. It also had 3.1g of Protein which is pretty high for something like this, 32.1g of Carbohydrates (14.6g of which sugars) and under 1g of Fat per bar, and even 2 and a half bars would have under 1g of Fat, which shows how little there is in the entire thing. If you do happen to live near a shop that sells these then try them, they’re a little pricey (55p per bar) but are well worth it. P.S. Since originally writing the review for this a couple of months ago, I have since found these in a few online stores. I highly suggest checking out this now if you are a licorice fan. ‘The chews that ooze’ are the latest Starburst product. They only came out a couple of weeks ago and so I figured with the ad campaign and everything, I should try and put up a review posthaste. To be honest, as you’ll see below the advert doesn’t tempt me that much, the ‘ooze’ looks really thick and…just not that good. But eh, only one way to find out how these are. In fact, watching the advert again, it sounds like the guys at Starburst recorded someone making a mess of their toilet in the way we’re all familiar with, it’s quite disgusting really. There are three flavours that I will review individually: Orange & Mango, Raspberry & Orange and Pineapple & Orange, so evidently orange is the flavour of the day. Orange & Mango – Really nice flavour. The sweet itself is orange, with the liquid centre being mango flavoured, so orange is the main flavour with the mango coming through and then going. Very sweet, but really pleasant. Raspberry & Orange – A much tamer flavour than the previous one. Raspberry is the base flavour here, and it’s not as strong as the orange flavour. Still very good though. Pineapple & Orange – I’m not a fan of pineapple, and here it’s the base flavour. It’s a strong pineapple and tastes very true to normal pineapple. The orange doesn’t come through at all though which is a shame. Pineapple fans will like this. I haven’t actually put up my other Starburst articles (a redux of the original Starburst, as well as the Strawberry Chews), but suffice it to say this is by far the best of the lot. The flavours are all good, real fruity flavours without relying too much on artificial sweeteners and flavours. I thought these would be a bit gimmicky, but congratulations to Starburst, they’ve done a good job here. The pack has 162 calories, 0g Protein, 34.3g Carbohydrates and 2.5g Fat. I just want to begin this post by apologising for not posting yesterday. I just…forgot, sorry, strange how it slipped my mind but there you go. From now on I’ll probably be running this on a 6 day week anyway as on Sundays I will be writing a piece for my friends over at the Chocablog. Yes it seems Dom has recognised my awesome writing talents and has recruited me. So look forward to seeing my posts there as well, though of course the main bulk of my time is going towards this site. But now, back to this! Double chocolate is an odd flavour when it comes to dessert. 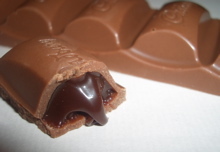 The basic idea of it is milk chocolate on top of milk chocolate, and so whilst it can work well in some situations, what are the chances of Cadbury getting it right for their Dairy Milk? Well first off, what do we have? 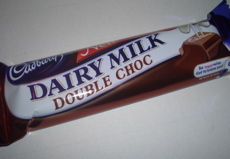 Like all Dairy Milk varieties, this is a standard Dairy Milk bar that has the filling inside it. So we have an ordinary Dairy Milk, that has some sort of slightly richer milk chocolate inside. The chocolate inside is darker in colour, though according to the back of the pack it’s a ‘chocolate flavoured centre’, so that’s hardly whetting my appetite. To be frank, I’m not impressed with this bar. It doesn’t taste that differently to the Dairy Milk with Caramel, it has the same consistency and there’s no real problem with the bar, it’s just a little tasteless, very ordinary milk chocolate with…milk chocolate inside. The chocolate inside is quite tasteless, and personally I feel there are better things that Cadbury could put into their Dairy Milk bars, like peanut butter, or a milk chocolate truffle or something, this is just lazy. The bar has 220 calories, 2.6g Protein, 28.2g Carbohydrates (23.9g of which sugars) and 10.9g Fat (6.5g of which saturates). I don’t really recommend this though, not only are there much better chocolate bars, there are much better Dairy Milk chocolate bars. Another bar from my American goodie box is the Take 5 from Hershey’s. I was told this was a slightly odd one, combining a pretzel with chocolate, peanuts and peanut butter. They weren’t wrong with that. An odd combo indeed, pretzels are nowhere near as popular in Britain as they are in America, so with the salty pretzel, salty peanuts and salty peanut butter, I think I was allowed to be a little cautious about how this bar would turn out. So how do they come together? Well, first as you can see in the pictures there are two of these little chocolates in the pack. I put them on my eyes in order to show how big they are (I realise there was probably an easier way to do it, but come on, you know this way was better), now what you get is a large pretzel, with peanut butter on top of it. Peanuts are then top of that, and the whole thing is then covered in chocolate. So we have a 3:1 salty:sweet ratio here. And that’s pretty much how it tastes, you get a really strange mix of salt and then sweet, which is something I’m admittedly not used to. So I taste the sweetness of the chocolate, and then all of a sudden a piece of pretzel will touch my tongue and I get a big hit of salt. But is it good? My word yes it is very good. I’ve said in the past and must reiterate again that I dislike peanut butter in its normal form, but this comes together so, so well. The pretzel and peanuts are nice and crunchy, adding a solid base and their own saltiness. The peanut butter is the main flavour of course, and that’s really what you’re tasting, along with the sweetness of the chocolate mixed in. It’s an odd bar, I won’t deny that, and whether it’ll suit British taste buds or not I’m not sure. But if you like Reese’s stuff, and can handle a salty/sweet mix, then you’ll like this. The entire package has 210 calories (100 from fat), 4g Protein, 25g Carbohydrates (18g of which sugars) and 11g Fat (5g of which saturates). P.S. I realised after that this also has caramel, the fact that I didn’t realise this whilst eating it shows how little it adds. Also, I know it looks like I have bogeys in my nose in the second picture, I assure you that I checked before and after and I don’t, it seems to be some sort of weird camera flare or something, and if you didn’t notice it before…you sure as heck will now.